Ripley’s Believe It Or Not! 100 YEARS!! 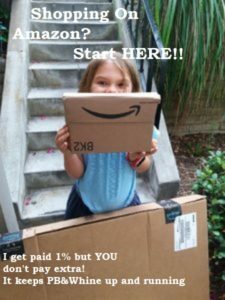 You are here: Home / Review / Ripley’s Believe It Or Not! 100 YEARS!! Ripley’s Believe It or Not! is 100 years old!! There is no better way to celebrate than with a brand new book. Ripley’s Believe It Or Not 100 Years. This book has every thing you want to know about Leroy Robert Ripley! From childhood and all through his life. Seriously very interesting man. This is a coffee table book for the entire family!! This is a beautiful coffee table book, starting with the sepia colored cover that will have you staring at the pictures on the cover. The 100 looks very 3d, with eyeballs in the 00’s. Sitting on the coffee table it’s irresistible to guests. They HAVE to pick up the book. It’s like the book calls to them. The 2018 edition has page after page of insight how Ripley’s Believe It Or Not started and continues to be a popular icon. 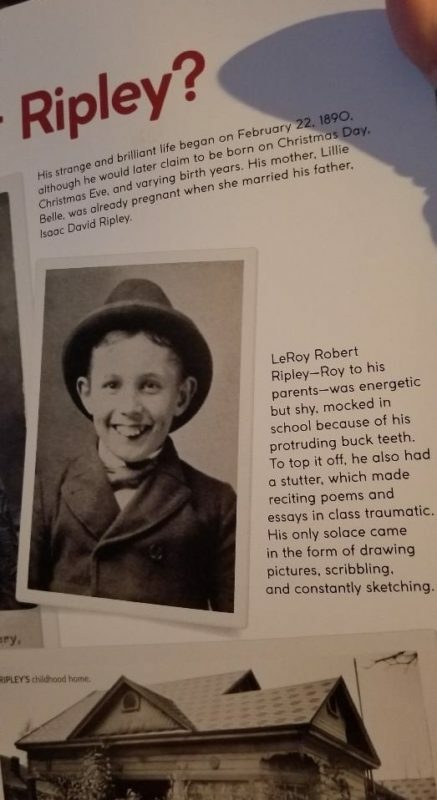 One of the things I didn’t realize is what an amazing artist Robert Ripley was. This book really highlights a lot of his work. This books shows the different places that you can find a Ripley’s Museums and Odditoriums. (I love that word! Odditorium! It’s one of those fun words to say! Odditorium!) Sorry, got a little carried away there. Inside the book are also little hidden gems like copies of the 1940 & 1941 administration tickets a Ripley’s Believe It or Not show. 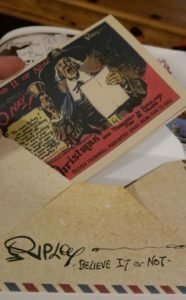 There is also a Christmas card from Robert Ripley. Just another fun little gem hidden in this large coffee table book. Of course, there were pictures that really pop out at me for instance how about a dress made completely of Twizzlers!?! Gee, I sure hope you don’t get hungry before you get back home! Nope! This book would make an amazing gift for anyone on your Christmas list; especially those that love the ODD and weird! I think my son would like this! What an amazing & interesting book. And yes, great as a Christmas gift! NewAir 126 Can Beverage Fridge!! Bring On The Snow!! I could use a VOTE for Alice! !